President Barack Obama speaks as he tours the Federal Correctional Institution El Reno in El Reno, Okla., July 16, 2015. Obama is the first sitting U.S. president to visit a federal prison, in a push to reform one of the most expensive and crowded prison systems in the world. Earlier this week, President Barack Obama commuted the prison sentences of 46 people serving lengthy jail terms for nonviolent drug offenses. On Thursday, Obama continued his commitment to prison reform when he became the first sitting president to visit a federal prison. According to the Associated Press, Obama visited with staff and inmates at the Federal Correctional Institution El Reno, a medium-security facility near Oklahoma City. 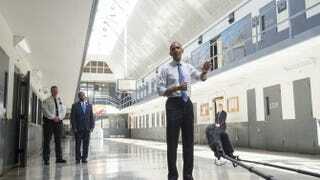 Officials opened a cell for the president so that he could see how prisoners are confined. The news site notes that the cell contained "a double bunk bed and third bed along the wall, a toilet and sink, along with a small bookcase and three lockers." "Three full-grown men in a 9-by-10 cell," the president noted. The president sat with some six inmates, who told him of their experiences both inside and outside prison. "When they describe their youth and their childhood, these are young people who made mistakes that aren't that different than the mistakes I made," Obama said. He added that had the men had support structures growing up, they may have made vastly different choices. The sentiment is part of a bigger push from the Obama administration to end harsh punishments for nonviolent drug offenders, which includes the elimination of mandatory minimum sentences. The president said that this country has become immune to the number of young people incarcerated for long periods of time for stupid mistakes. "It's not normal," he said, according to Vice News. "It's not what happens in other countries. What is normal is teenagers doing stupid things. What is normal is young people making mistakes." He added, "We've got to be able to distinguish between dangerous individuals who need to be incapacitated and incarcerated versus young people who, in an environment in which they are adapting but, if given different opportunities, a different vision of life, could be thriving the way we are." Read more at the Associated Press and Vice News.